GFT, the name I hate to hear whenever it is mentioned. I deposited $30,000 with them and once I was making profit, they blocked until my positive turn negative. One day, my $3,000 profit turned negative and many more. The system they operate again is that when I place a wrong order, then I am finished. You be blocked until you money runs off and when asked they will tell you to try logging in with “DEALBOOK 360”. You to dealbook360, you cannot still log-in. Very bad broker, run away. GFTUK is a global forex brokers founded in 2001, USA. They are trusted market leader with a lot of partners and parent company Forex.com, which is one of the famous company. They offer different options for trading such as forex(120+ currency pairs with spreads as low as 1 pip on the majors), metals, stocks, Commodities, CFDs (Speculate on 3,200+ markets), binary options, Spread betting and other. GFT Markets is a trading name of GAIN Capital – FOREX.com UK Limited, this good broker is regulated by the Financial Conduct Authority. FCA No. 190864. You can use maximum leverage of 400:1, giher the leverage, higher the risk. The lot size is different – Micro, Mini, Standard, 1000, 10000, 100000. They have low fixed spread, so this broker is comfortable for scalper traders. You can trade with different platform such as MetaTrader 4, DealBook 360, Web platform and also Mobile platform, so you can trade from everywhere. You know how important is to have quality broker, where you can trade and win money more comfortable, so GFT broker provides a lot of options for trading such as low margins, no commissions, Tax-Free Trading, indicators, exchange-style look, strategies, signals, reviews, market outlook and many other important things. GFTUK The minimum deposit with Debit/Credit card is £50 for existing accounts and £150 for new customers. The deposit time is up to 1 business day without any fees. All clients funds are fully segregated, so your money will be at safe place. 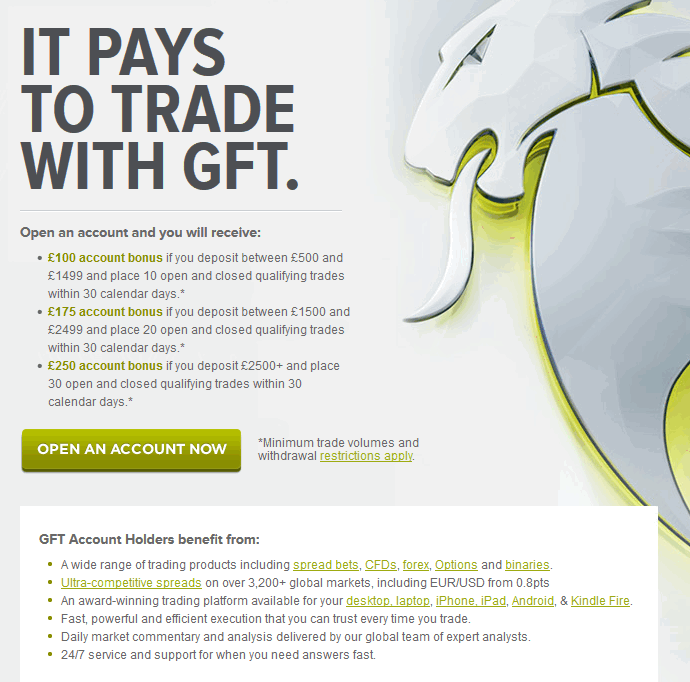 GFT offer signup bonuses depends on how much money you will deposit. So, if you open an account and deposit minimum £500, you can receive up to £100 signup bonus. If you deposit between £1500 and £2499, your bonus will be £175. If you deposit £2500+ and if you have 30 open trades, you will receive up to £250 signup bonus.